James Ruterbories P.C. has practiced law in the state of Colorado for more than (16) years, which has given him extensive experience in a wide range of legal issues. That means when it comes to receiving the legal services that you need to handle your business, civil, family law, probate or criminal case you should look no further than his law firm. The law is designed to help keep things fair between different parties, but the legal system can be a bit too complex for many people to move through on their own. That is where attorney James Ruterbories is able to help. He has spent his career diligently providing legal services of all kinds to his clients. 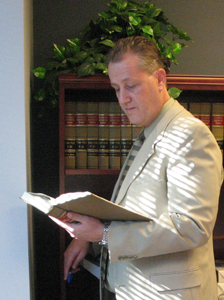 Contact our litigation attorney when you are in need of legal services in the Denver, Colorado area. Mr. Ruterbories is ready to help you make sure your rights are upheld.